Is it snowing in The Summit at Snoqualmie ?Merci! This is a duplicated entry. See Summit at Snoqualime pages. The Summit at Snoqualmie, in the United States (Washington State), is a large resort with 26 lifts (20 chair lifts & 6 surface lifts) that offers skiers an impressive 695 metres (2280 feet) of vertical descent. The Summit at Snoqualmie has 114 trails. 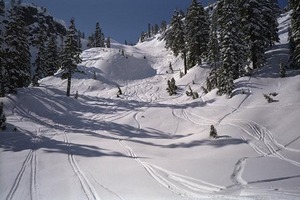 The Summit at Snoqualmie is best suited to intermediate skiers and snowboarders but there is some terrain for beginners and advanced skiers. There are 55 kilometers (34 miles) of cross country ski trails at The Summit at Snoqualmie. For snowboarders, there are 3 terrain parks and a half pipe. The nearest airport is at Seattle and the nearest train station to The Summit at Snoqualmie is at Seattle.